A recipient blackout is a “do not disturb” period, during which availability alerts are not sent to this recipient. You can use blackouts to restrict alerting to specific times, for example, to alert different users at different times of the day (or days of the week). To disable alerting during maintenance periods, use monitor blackouts instead. Monitor and recipient blackouts affect availability alerts (like HTTP errors or timeouts), but not performance alerts. 8 AM - 5 PM on business days. 5 PM - 8 AM on business days. For team 1 members, blackouts should include weekends and the hours 5 PM - 8 AM. For team 2 members, blackouts should include weekends and the hours 8 AM - 5 PM. For team 3 members, blackouts should include business days. From the top menu, select Alerts > Alert Recipients. Click next to the recipient whose blackouts you want to view. From the top menu, select Notifiers > Notifiers. Click the icon next to the recipient whose blackouts you want to view. The blackout hours are displayed in the time zone selected in your AlertSite preferences. On the Alert Recipients screen, click next to a recipient you want to add a blackout for. Select the blackout type – one-time or recurring (repeating every week) and click Next. Specify the From and To date and time, and then click Finish. Click a recipient in the list. On the Manage Notifier screen, click Blackouts at the upper right. 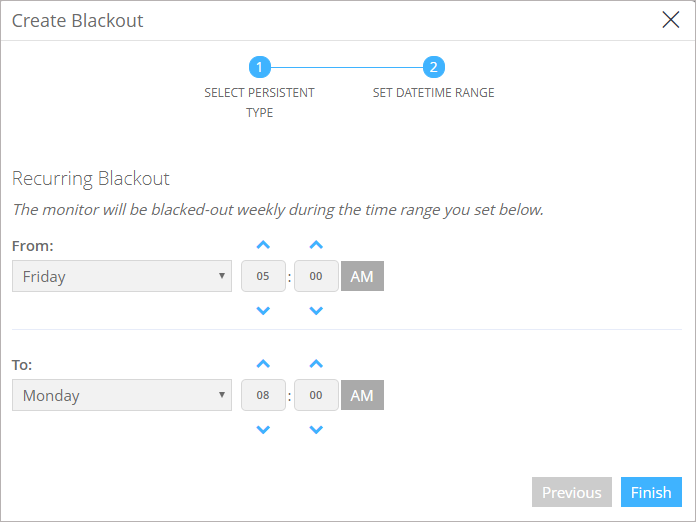 Select the blackout time –persistent (recurring every week) or one-time. On the Alert Recipients screen, click next to the recipient. Click next to the blackout you want to edit. Change the From and To dates, and then click Save. On the Configure Notifiers screen, click the icon next to the recipient whose blackout settings you want to change. Change the Blackout From and Blackout To dates, and then click Submit. Note: You can edit only recurring blackouts. To change a one-time blackout, you must delete and recreate it. Click Delete next to the blackout you want to delete, and confirm by clicking OK.
On the Configure Notifiers screen, click the icon next to the recipient whose blackout you want to delete. Select the Delete Day check box, and then click Submit.